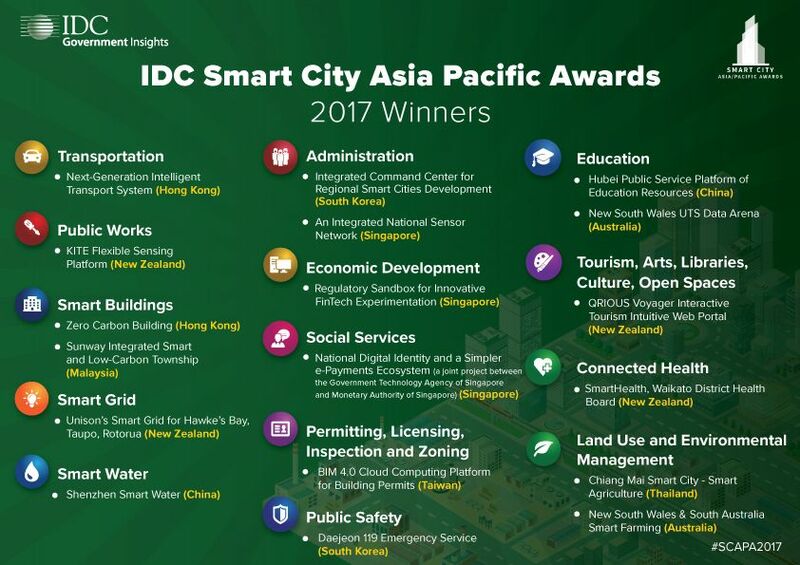 SINGAPORE, Aug 04th, 2017: IDC Asia/Pacific announced today the winners of the 2017 Smart City Asia Pacific Awards (SCAPA) with New Zealand and Singapore leading the way in the most number of smart city initiatives recognized at four and three, respectively. Other winners include Australia, South Korea, Hong Kong, and China with two wins each. Malaysia, Taiwan and Thailand have been awarded with single wins. “Asia/Pacific smart city projects in the past year have exhibited strong national development focus with an increasing citizen-centric personalization combined with ‘low investment-high impact’ agendas all in hopes of attracting the right mix of manpower talents and lucrative foreign-direct investments,” says Gerald Wang, Head of IDC Government and Education Insights Asia Pacific. “The above-mentioned trends still hold true with many Asia Pacific smart city programs today. Functionally, beyond the notable focuses of public safety and transportation over the past years, we are also seeing more investments in other smart city functions such as education, connected health, land use and environmental management, smart buildings as well as administration. This signals notable efforts by city governments and planners to build better local competencies and improve local livability standards, thereby reinforcing how Asia Pacific smart cities are the next-beacon of growth for national socioeconomic sustainability,” adds Wang. IDC Government Insights went through a rigorous six-phased benchmarking exercise to determine the Top Smart City projects for 2016-17. These included identifying and cataloging the key Smart City projects in Asia/Pacific by IDC Analysts across APeJ (25%), online voting to determine public opinion (50%), and the assessment of an International Advisory Council (25%). To get more insights about the case studies of the 18 Smart City Winners, the IDC Government Insights Smart City Development Index for 2016-2017 will be published later this year. For queries about this research, contact Gerald Wang gwang@idc.com. For more information on SCAPA, visit http://www.idc.asia/IDCSCAPA/. For media inquiries, contact Tessa Rago trago@idc.com or Alvin Afuang at aafuang@idc.com.